Green Apple Portraits would like to announce our 2014 Holiday Mini Sessions! We have constructed a beautiful Winter Wonderland scene perfect for families. This scene lends itself to any color outfit but we do love how it looks with children wearing white, cream or gold. Session fee is $200 for a 20 minute session for up to two children. Additional children will require a longer session and cost an additional $25. You will presented with 5-7 fully retouched ready to print images on our website. You will be able to download the full resolution files to use however you would like. 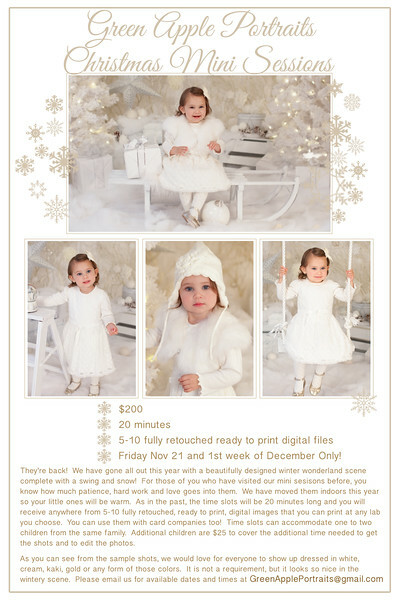 You can print from them or use them on card websites such as http://www.tinyprints.com/storefront/GreenApplePortraits. Well behaved pets are welcome but there are limited spots as we only offer them on the last spot of each day. Please email or message us to check for availability. Thanks and we look forward to seeing your children in our Winter Wonderland!